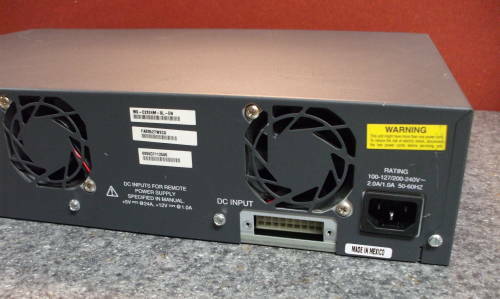 This page shows how to disassemble a Cisco Catalyst 2900 series XL Ethernet switch in order to access and remove its power supply in hopes of repairing a dead switch. The switch was completely inoperable. Nothing happened when AC mains voltage was applied. The problem was within the power supply — it supplied absolutely no power. 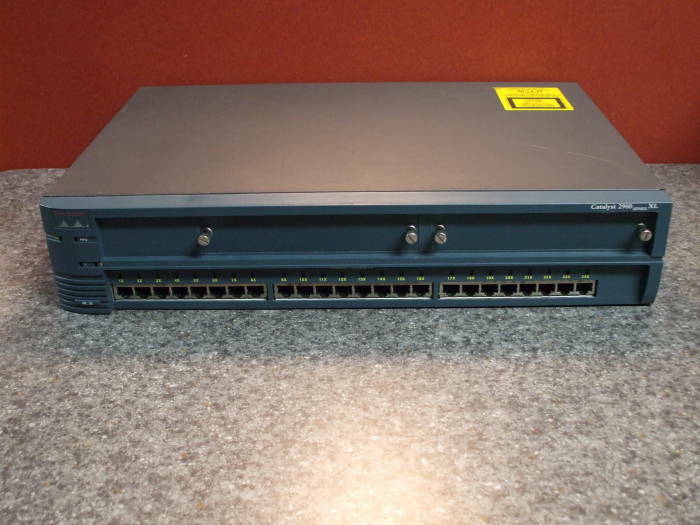 Here is a Cisco 2924M-XL switch. It has twenty-four 10/100 Mbps ports. It is slow by today's standards, but this is a managed switch supporting VLAN trunking with 802.1Q, and it can be monitored and managed with SNMP. Four 10/100 Mbps Ethernet ports. Two 100Base-FX 100 Mbps fiber ports. One 1000 Mbps Ethernet fiber port. The switch seen here has no modules installed, there are two cover panels held in place with thumbscrews. 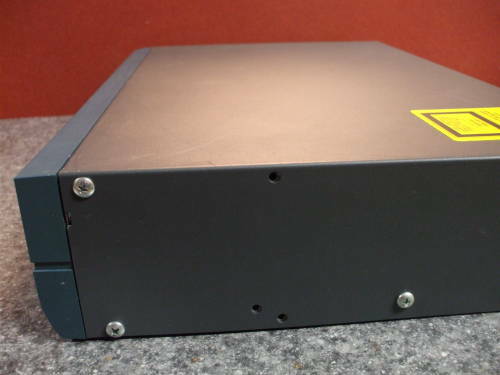 Start by removing any installed modules and cover panels. 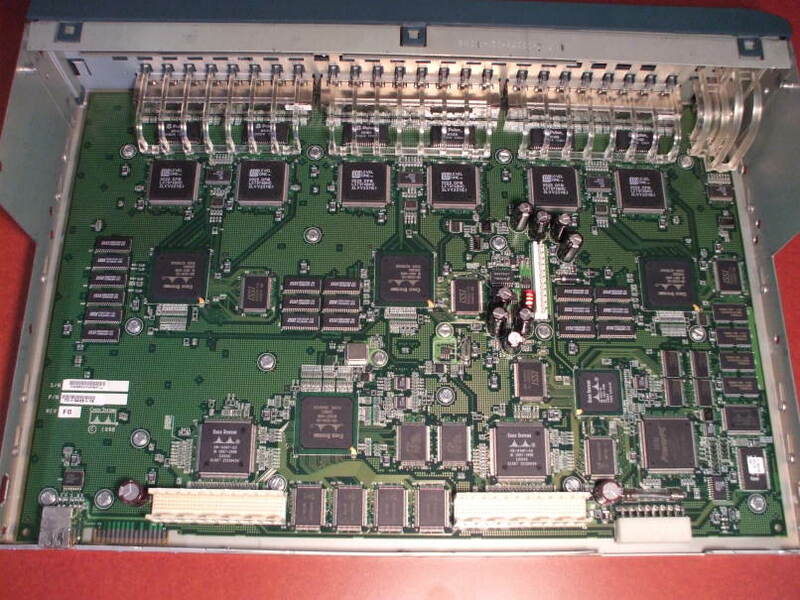 Module covers removed from 2924XL-M Ethernet switch. A set of holes on the sides go through the cover, through holes in the base frame, and into threaded holes in the chassis. 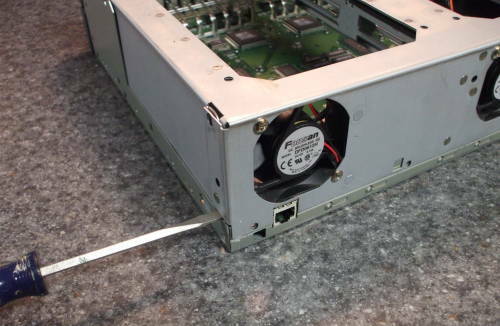 Some of them can be used to install brackets for mounting the switch in a rack. Removing the screws used to attach the rack mounting brackets. 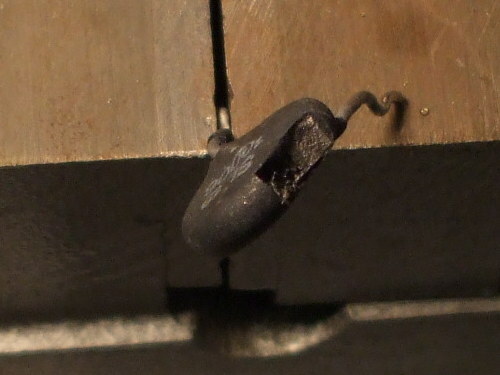 Remove the series of smaller, hex-head straight slotted screws across the rear face of the cover. 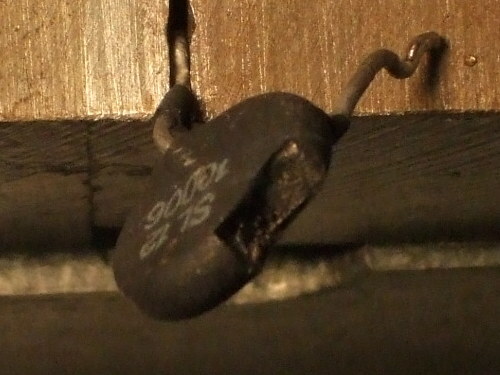 These are the screws parallel to and just above the bottom of the rear face. Do not attempt to remove the two screws holding each fan in place. Removing the screws holding the rear face of the cover. Slide the cover straight to the rear. It may be very tight at first. You can get more leverage by placing your right thumb against the exposed base frame, around the "DC INPUT" connector, and pulling to the rear with your fingers. The front panel is plastic, be careful not to break it by placing the switch face-down while trying to get better leverage. Once the cover has slid about as far as seen in this picture, it will be free around the front edge and it will move much easier. Remove the cover and lay it aside. A base frame makes up the bottom and front of the switch, with a short edge down each side. That darker metal, mostly along the bottom edges, is the frame. 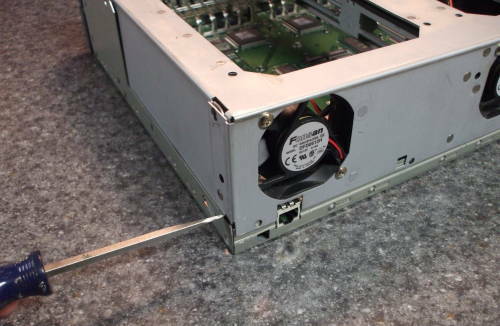 The lighter metal, including the mains power connection and fans, is a chassis that must be removed. Rear corner of the chassis and frame. Prying the chassis from the frame. Use a slotted screwdriver to loosen the chassis from the frame. I have pressed the screwdriver blade into a narrow joint between the two components. Turning the screwdriver will force the rear of the chassis up very slightly. Repeat this on the opposite side. At first you will find that lifting one corner will force the other corner back into place. You can see in the last picture above that the chassis is rising very slightly. A gap now appears above the RJ45 connector for the console port. Stop once you have the chassis free at the rear. 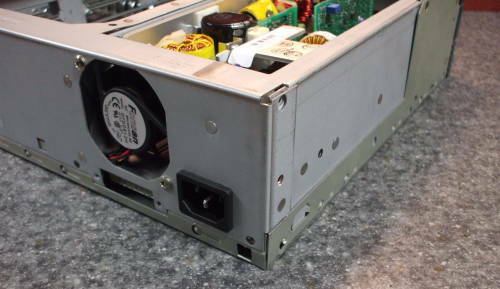 The power supply is on the chassis, the main board is mounted into the base. The power connector must be disconnected before continuing. 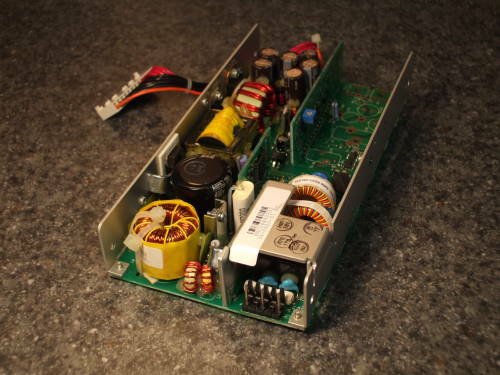 Power connection to main board. 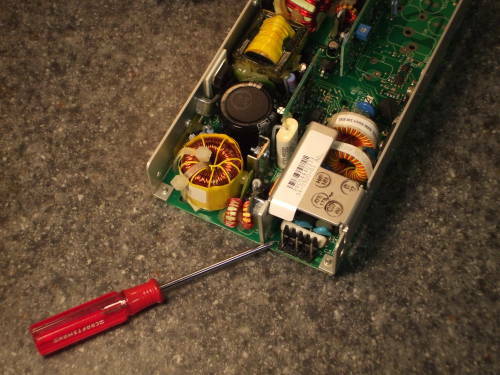 Loosening power connector from main board. The connector is held into place with a plastic lip that has snapped into place. Insert a slotted screwdriver between the connector body and that lip, and rotate it enough to disengage where the edge of the lip has caught a series of teeth on the connector. Then gently pull the connector straight up from the board. It should come loose easily, do not force it! If it seems to need much force, then you probably have not yet disengaged that plastic retaining clip. Remove the connector and let it just lie loosely on the main board. 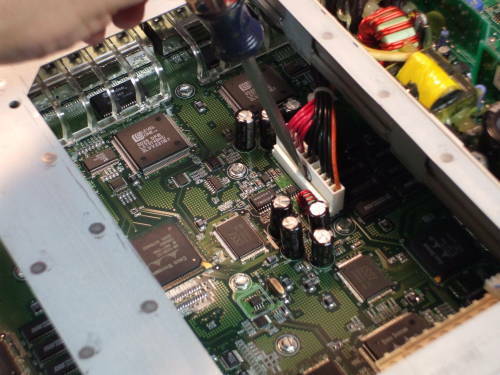 Power connector is removed from main board. You will see that there is a short aluminum standoff at each top front corner of the frame, and the chassis is meant to pivot around that as you lift the rear of the chassis away from the frame. Removing chassis from lower frame. Frame and main board after chassis has been removed. Rotate the chassis up to an angle of 30-45° and lift it off the frame. 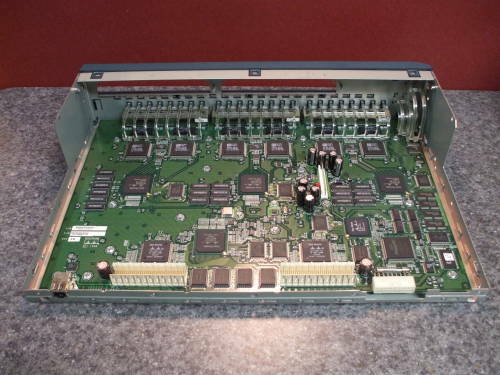 Main board of the Cisco Catalyst 2924M-XL. The port status and activity indicators are surface-mount LEDs. 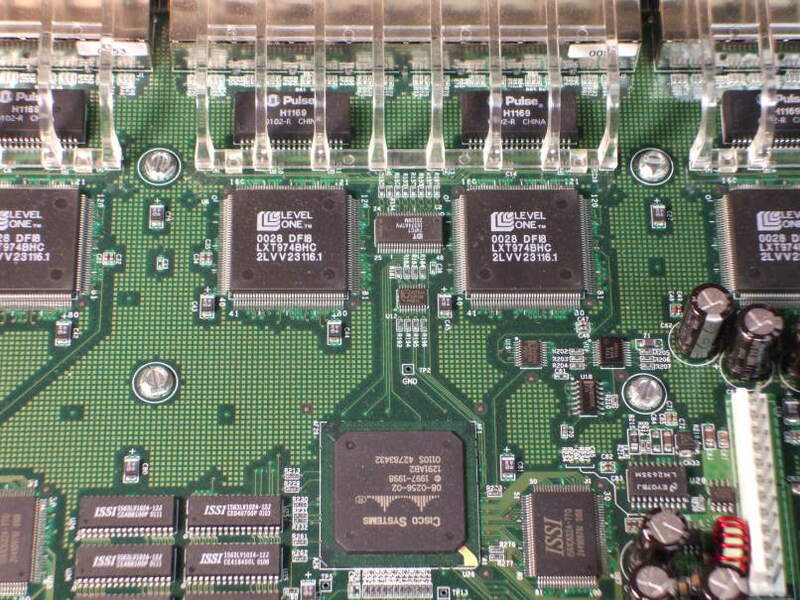 The clear plastic frameworks across the top of this picture are light pipes so they appear to be directly above their ports on the front panel. A closer view of the central board and the port status and activity indicator LEDs and light pipes. 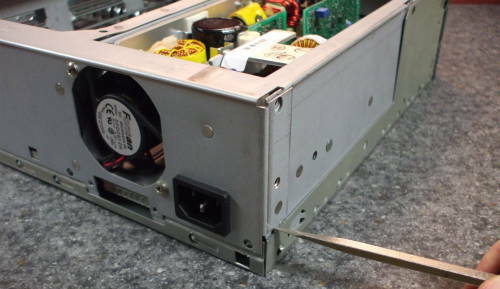 Remove the Molex connector from the mains power connector to the power supply board. This is the white plastic connector with the blue and brown wires seen at upper right here. Turn the chassis over and remove the four screws mounting the power supply to the chassis. Then turn the chassis back over again and slide the power supply out, sliding it toward the front of the chassis. 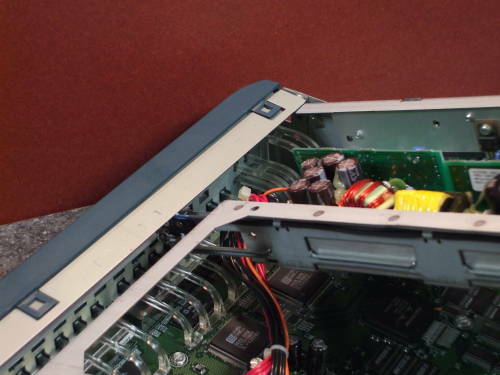 The rail which would mount the closer of the two modules needs to be bent very slightly to side as the power supply slides past. 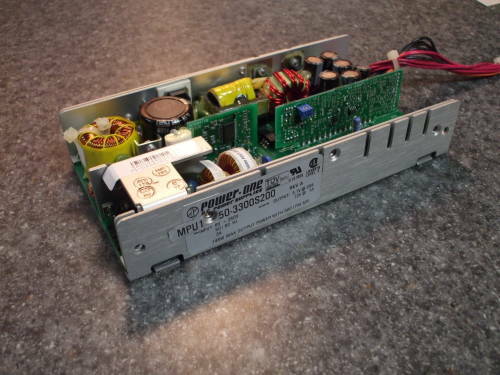 The Power-One power supply is built on one circuit board. 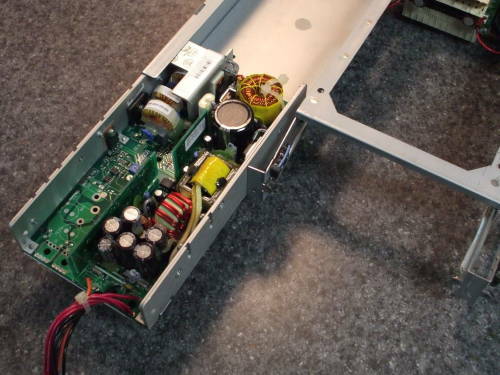 A rail is mounted to each side of that circuit board. 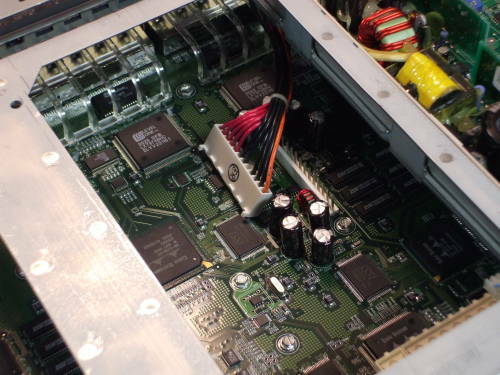 The circuit board and its rails are placed down in a C-shaped aluminum frame. That frame must be removed to work on the board. One tricky part is that you must first remove a small screw. It is almost hidden below a bracket and between some toroids forming the input filter. 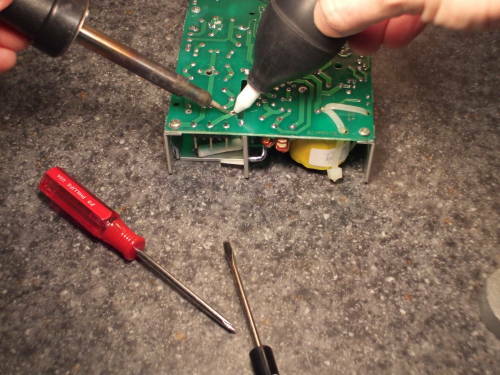 Removing power supply circuit board. Three flat-head screws on each side hold the supply into the frame, passing through the C-shaped frame and threading into those rails or short panels fastened to each side of the circuit board. Make sure you remove the correct screws. Other screws pass from inside to out, holding some components (transistors, regulators, a bridge rectifier) in place and sinking heat. 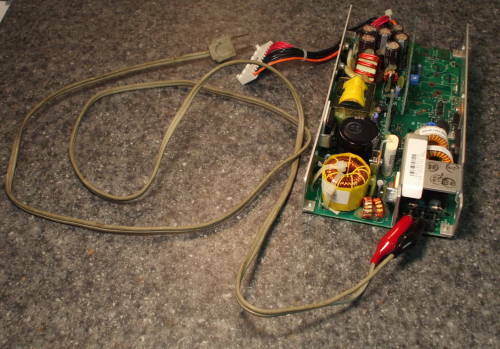 The power supply circuit board. Pointing out the blown fuse. 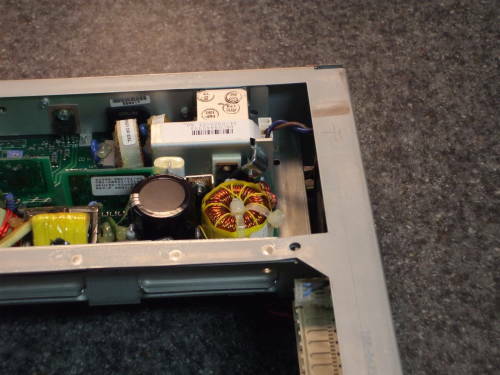 I finally have the power supply removed and ready for investigation, and, hopefully, repair. 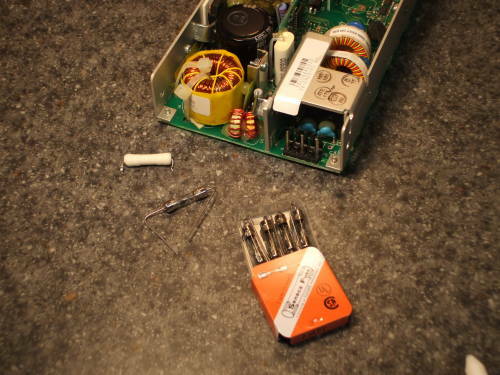 I quickly discovered that my first suspicion was correct: the fuse built into the power supply was blown. It has a white ceramic body, so you can't tell if it's good by looking at it. But an ohmmeter shows that it is an open circuit. 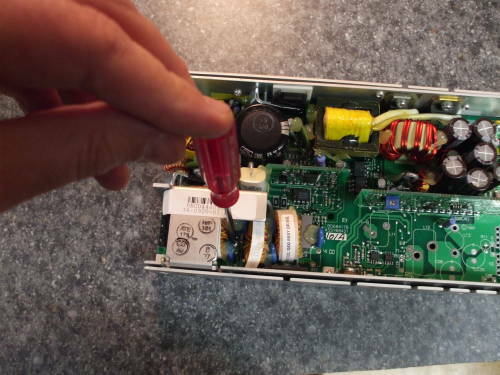 I have unsoldered the fuse, you can see that it has fallen from place. I need to remove the solder from the holes so a replacement fuse can be installed. Time for a very careful test. A "suicide cord" made from an extension cord and two insulated alligator clips will let me do the test. Of course, I had carefully verified which of the five pins on the circuit board was connected to the hot line, and which to the neutral. And of course you should do nothing of this sort as you might hurt yourself. Preparing to test the power supply. Looking closer, I found a suspicious component: a disc-shaped component had a corner missing and seemed to be burnt internally. This was old damage, it had happened in the past and was not done in my test. Why do I say that? Because the missing chunk was not there and there were no fresh scorch marks. This is component TR1 as marked on the silk-screened circuit board. It bears the marking: SL12 10006. That makes it an Ametherm SL12 10006-03 thermistor, a component designed to limit inrush current when power is first supplied to a circuit. It has an initial resistance of 10Ω, dropping to 0.242Ω at 3A current and to 0.120Ω at its full rated current of 6A. See the below simplified circuit diagram. I think that something in the switching circuit has failed, and now presents a constant very low impedance. Maybe the main switching transistor has shorted. 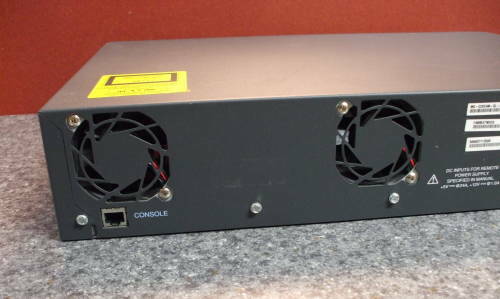 Meanwhile I was given a damaged switch with a working power supply, and I could assemble one working 24-port switch out of the two. 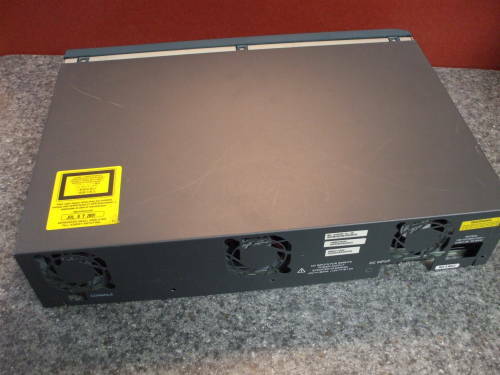 The power supply has three stages of bifilar-wound toroidal chokes with multiple capacitors and surge suppressors. The thermistor is in the hot lead just before the bridge rectifier. The thermistor is rated for 6A current, and the circuit is supplied through a 5A fast-blow fuse.